If anyone can give me any info about this tractor, it would be appreciated. It runs very good, (motor just purrs) has a Woods 59LB-1 mower deck, (in very good condition) new battery, All Season Goodyear 13.6X16 rear tires. Lights work, and PTO works the mower fine. It seems to be just a 2-speed. (up forward/down reverse) I do not notice any gear change when I move the transmission lever to the right or left. It has a new battery, belts, blades, spark plug wires and distributor, the carburetor looks new also. The tires are in very good shape also. I am just going to use the 154 to mow and keep it inside for the winter. 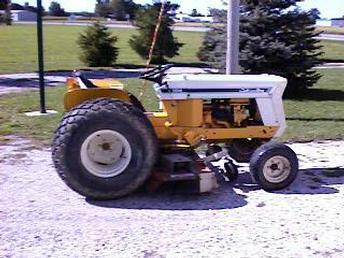 I have 2, 1440 Cub Cadet Garden tractors. I am selling one since I purchased the 154 Lo-Boy. The other I will keep for trimming and snow plowing. Again, any info would be deeply appreciated.